Turn your Home of Office into a Virtual 3D Gallery! This is a signed version of the 3D Anaglyphic Overdrive poster which appeared on the millennial January 2000 issue of OVERDRIVE, the Magazine for the American Trucker. The audience for the magazine was drivers, owner operators, and trucking executives. The poster has images on both sides and is signed by its creator Boris Starosta. 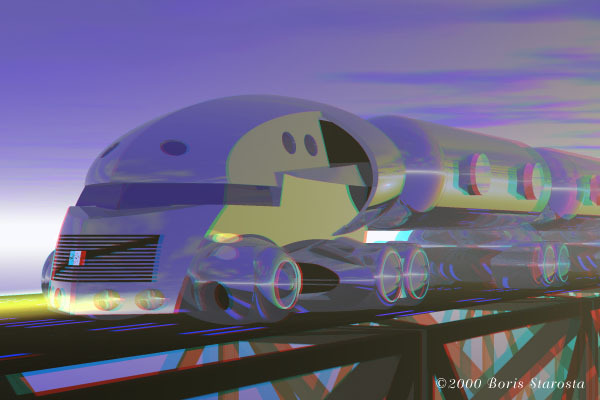 Like Boris's other 3-d computer art, the Overdrive cover and poster images are distinguished by being truly stereoscopic. Just like stereo photography, each 3-d image is actually the result of two separate perspectives, with the viewpoint shifted horizontally to accurately mimic the human spatial visual experience. This enhances the effect of depth, and provides tremendous three dimensional detail in each image. The images afford the reader a heightened sense of realism and a virtual immersion into the apparent three dimensional space. The poster is 20x30in, the three dimensional space needed to be compressed to make it more easily viewed at that size, it includes a anaglyphic card for viewing. The total depth visible in the poster is astounding. Click on the images for larger views! The backside of the Overdrive poster is devoted to an ad for Volvo Trucks North America. The image that you see here is similar to the one that went into this ad, the difference being that here is shown the tractor hauling a set of tanks. The published poster shows just the tractor. Click here to get glasses for viewing the poster!